This Stampin' Up! Punch Art Santa Tag was inspired by the Star Santas that I used to paint when I did tole painting. Thanks to the Star Framelits and punches, this is now a quick and easy project compared to painting a Star Santa. LOL! 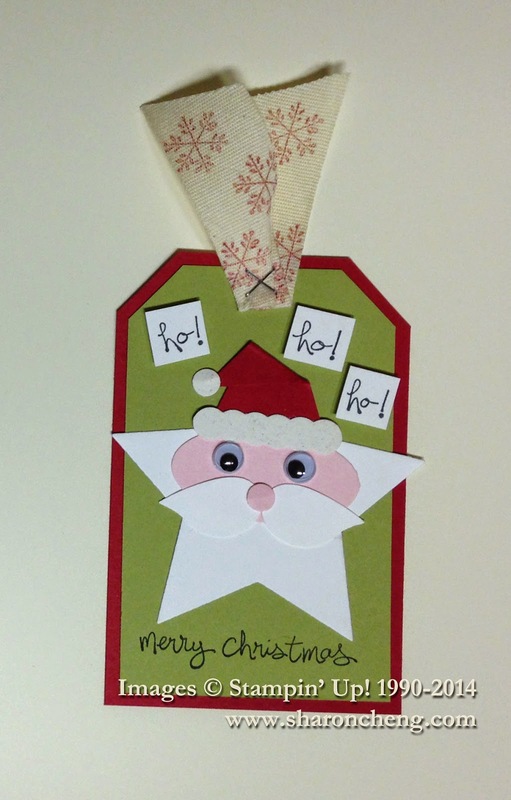 The video tutorial has more tips on how to make the tag and the custom ribbon. Notice the small staples that attach the ribbon to the tag? Stampin' Up! now has a handheld mini stapler. WooHoo! The words on the tag come from the soon-to-be-available Good Greetings Hostess Stamp Set. More information will be coming on how to get that stamp set. I love that font! And as the stamp set says, it includes some really good greetings! One thing I love about Punch Art is the seeing versatility of a punch. Who would have thought that the Bird Builder Punch can make a wonderful Santa mustache!